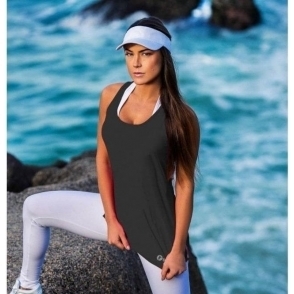 A truly beautiful fitness vest top with tie side detail, perfect for yoga, gym, tennis. Made from a very lightweight, breathable material that is silky soft. Available in White (pictured), Azure Blue, Grey and Purple Pizazz, some of the top colours for Spring. A very versatile piece which can be worn with your fitness leggings/capris, or with your jeans!